There is no doubt that our health care system is in bad need of reforms. Insecurity on all sides is strong and fears reach from the two-class-medicine to the loss of unrestricted work conditions for physicians. Since the introduction and application of managed care elements in European health care systems alternative forms of organization have become practicable and will substantially influence the development of our health care - not only with regard to physicians but also to patients. This book is dedicated to the practical ones among the professionals. It offers orientation and tries to clear up the thicket of information. 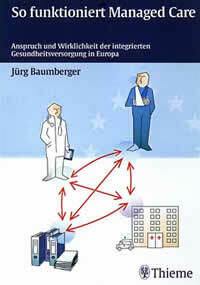 As a profound authority on conditions and circumstances in Switzerland and in Germany and as founder of the first European HMO the author is a recognized expert in managed care. In a practice-oriented way he illustrates chances and risks of managed care and shows how to take advantage of the opportunities arising from the change.